James Robinson and Greg Hinkle decide to go on an adventure and bring back the now public domain AIRBOY series of 1940s fame. 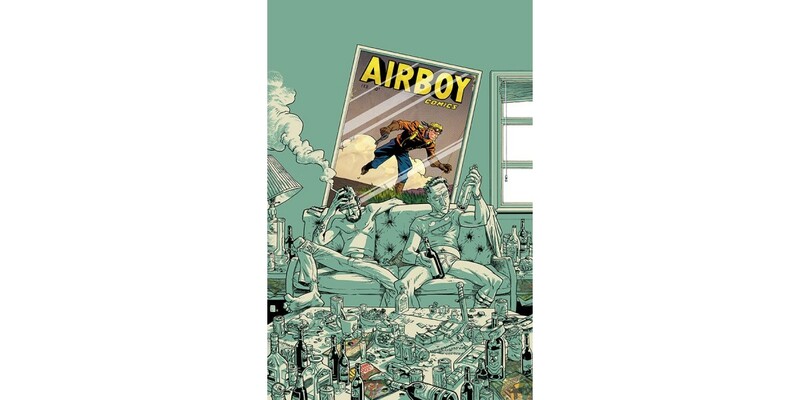 Created by Robinson (THE SAVIORS, Earth-2) and Hinkle and starring, well, Robinson and Hinkle, AIRBOY is the story of two comic book creators determined to breathe new life into a series that, while once wildly successful, had fallen into obscurity. This will be Hinkle’s debut at Image Comics. A humorous blend of fiction and reality (and a healthy dose of embellishment) AIRBOY begins the renewed journey of a character much beloved at one point, but forgotten today. “Oh and our characters are quite like they're depicted in the comic, including our weak wills, depravity, and cowardice,” added Robinson. Image Comics Eric Stephenson himself even makes a cameo appearance in the story. AIRBOY is a new ongoing semi-autobiographical series, inspired by the original Airboy comic series, coming to Image Comics in 2014.